It’s Turkey Time! What better way to share the holidays with your friends and loved ones than to serve roast turkey stuffed with delicious nutritious LifeField Buckwheat Groats. Just follow this simple recipe for a mouth-watering turkey stuffing for a thirteen to sixteen pound bird. Boil 3 cups water, add salt, stir LifeField buckwheat into boiling water, reduce heat, gently stir, cover, simmer just 5 — 6 minutes. Remove from heat. Discard excess water and set aside. In separate skillet, melt butter or margarine. Add onion, garlic and celery and saute 2 minutes over low heat. Add mushrooms, green squash, parsley, seasonings, white wine and heat gently for 5 minutes. Add water and stuffed olives. Cook 2 — 3 minutes longer. Remove from heat and combine with LifeField buckwheat. Wash turkey cavity with cold water after removing giblets. Using a large spoon, fill cavity to capacity with LifeField buckwheat stuffing mix. Close cavity with turkey lacers or sew it. Extra stuffing can be set aside, refrigerated or reheated and served. Pre-heat oven 10 minutes to 325°F. Line roasting pan with heavy aluminum foil. Place stuffed turkey breast side up in open roasting pan. Grease turkey breast well with shortening. Cover with cheesecloth (large enough to cover bird and drape down sides) moistened completely with water. Roast at 325°F in constant oven and baste at least 3 or 4 times after one and half hours cooking until turkey is done. Do not add water. Remove cheesecloth for the last 20 minutes. Allow four and a half to five hours for a thirteen to sixteen pound bird. Heat on low flame until ready (10-12 minutes). Add salt. Set aside. In frying pan saute mushrooms and onions in vegetable oil until “golden” (about 10 minutes), add two teaspoons of flour and stir for about 5-7 minutes. Add a cup of half-and-half (or sour-crearn mixed with water) and stir again. Add salt, black pepper, cut garlic and fresh dill. Add any spice you like such as bay leaf. Stir until mixture boils; turn flame down at once — the sauce should not be kept boiling. 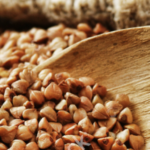 Place LifeField Buckwheat groats on a large serving platter and cover with sauce. It may also be used as a garnish and served with meat, meat balls, chops, or fish. Pull off large outer cabbage leaves and some smaller ones. Wash, cut out bottom core with paring knife. Cook in boiling water to cover for about five minutes or until leaves soften. Drain. Melt butter or margarine, add mushrooms, saute on low flame for three – four minutes. In separate skillet fry bacon until slightly crisp, remove excess oil, mince and set aside. Boil 1 cup of water. Season with salt and pepper. Stir in LifeField Buckwheat. Reduce heat, gently stir, cover and simmer 8 – 10 minutes. Incorporate mushrooms, bacon, scallions into LifeField Buckwheat, mix well. Place six to eight large cabbage leaves on flat surface. Insert smaller leaves in each and fill with two heaping tablespoons of LifeField Buckwheat stuffing. Fold and shape stuffed leaves into a compact round. Arrange in a casserole with sealed edge of leaves down. Add chicken broth, cover, bake in preheated oven at 350 degrees for 15 minutes. Add more broth if necessary. In saucepan heat butter, add onion, celery, green pepper. Cook for five minutes. Acid tomatoes, simmer for five minutes. Serve on platter with vegetable garnish. 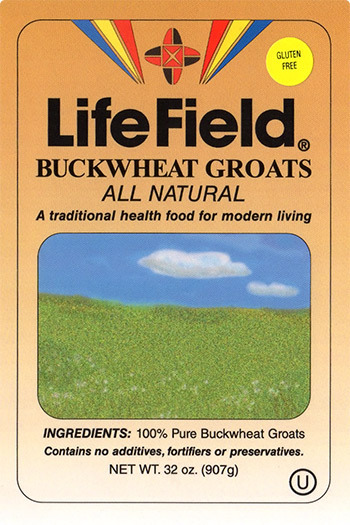 ENJOY this delightful treat from LifeField Buckwheat !